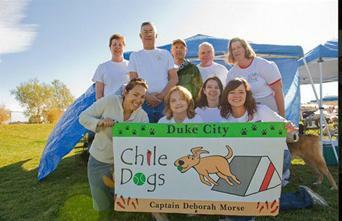 The Duke City Chile Dogs were New Mexico first FlyBall team and are members in good standings with NAFA and U-FLI FlyBall Associations. 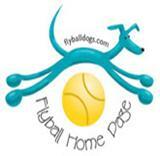 FLYBALL is a relay race with 4 dogs on a team. The course consists of a set of starting lights, a start line, a timing system, 4 hurdles and the box. The dogs jump 4 hurdles and step on a spring loaded box that sends out a tennis ball. The dog catches the tennis ball and then runs back over the 4 hurdles. When the dog crosses the starting line the next dog goes. The first team to have all 4 dogs run without errors wins the heat. Races are made up heats from 3 to 5 heats to a race and usually 5 races a day over a 2 day schedule. Want a demo for a special event? Just want to say Hi E-mail us.